I started the week by painting “Paper Planes”, my largest mural to date (until the next one!). The 30m long wall was provided by the municipality of the 13e arrondissement, who encourages street art in the area. The wall is outside a primary school, which is why I decided to feature a boy and a girl. They are seen flying, wearing aviator glasses and hat, and throwing paper planes in the air. I came back to one of my favourite area in the 13e, la ‘Butte-aux-Cailles’. One of my pieces there got damaged so I repainted a new one on top, it is located on the side of a grocery store right in the heart of the area. 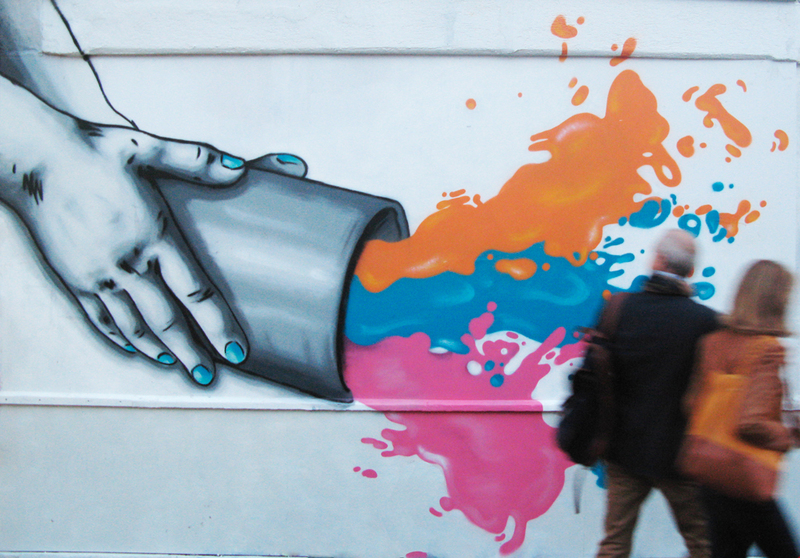 The mural represents two hands throwing a bucket of paint to pedestrians. During the 3 days event, artists from all over Paris open their studio to visitors and shows are taking place all over the city. I was teamed up with Herve Perdriel, a contemporary artist who creates beautiful digital collages printed on aluminium. 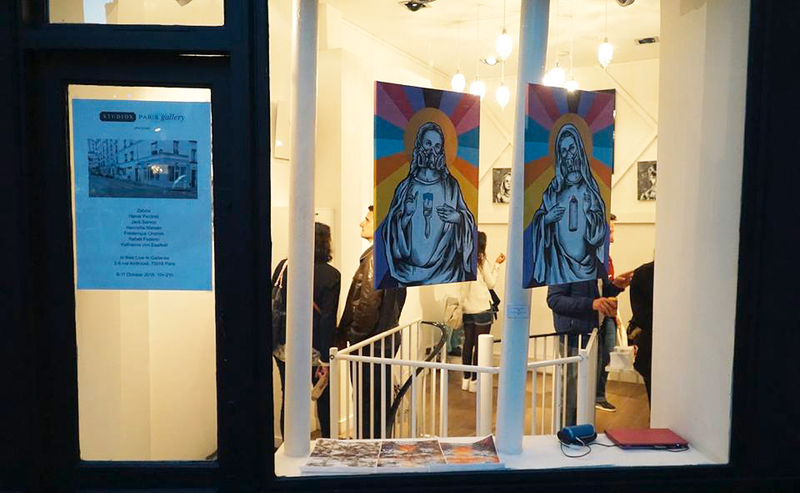 Our pop-up show was located in Montmartre in the StudiosParis. On the last day of the show, a performance was scheduled on a wall opposite the venue. 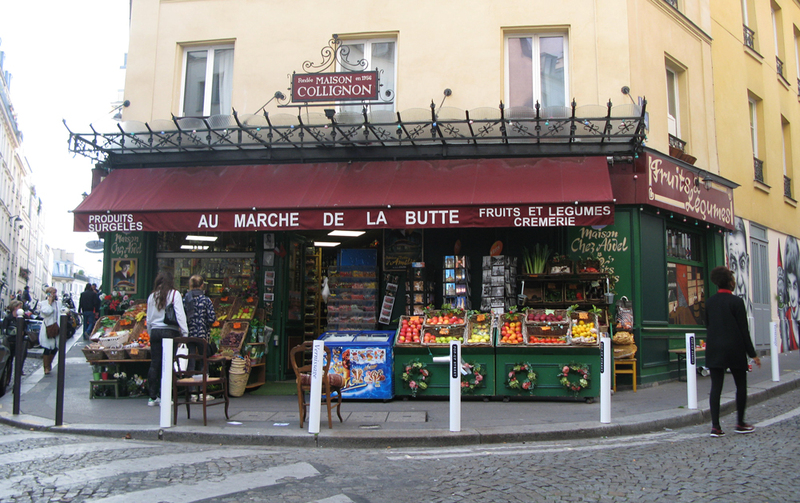 The street is famous for the grocery store ‘Maison Collignon’ which appears in the internationally known movie ‘Amélie Poulain’. It was the perfect occasion for me to do a Amélie themed mural featuring Mr Collignon, Amélie and the nain!